The AHIA Gala Awards Dinner will be a prestigious night for Delegates, Speakers, Sponsors, VIPs, and industry guests to come together and acknowledge the efforts of individuals who are innovators and leaders in the rotary-wing industry. It’s a night to host clients, celebrate with colleagues, customers, staff and industry associates. The dinner and awards ceremony is a special event on the conference program. 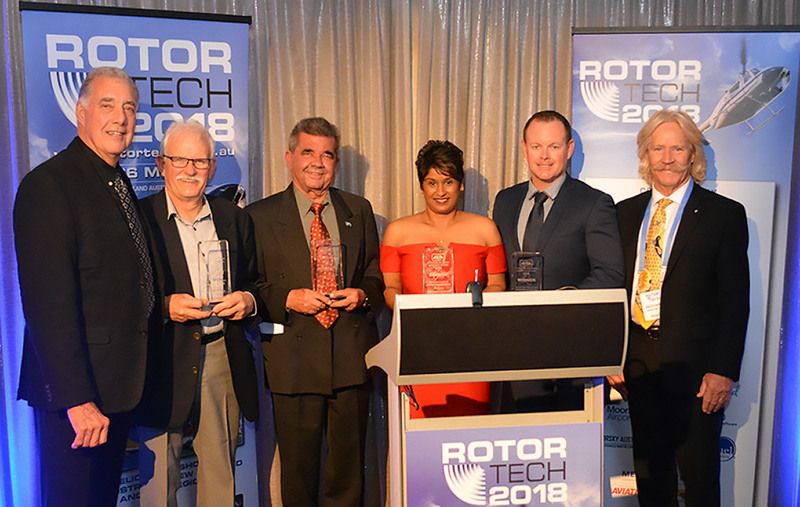 The Australian Helicopter Industry Association (AHIA) presented its inaugural annual industry awards at the ROTORTECH 2018 gala dinner, attended by over 200 guests. Created to recognise excellence and dedication of personnel working in the helicopter industry, the awards highlighted winners in the categories of helicopter pilot, maintenance engineer, aircrew person and support person, nominated by their peers. "The Australian helicopter industry is made up of thousands of dedicated people whose commitment and passion for what they do contributes to both commercial success and safety," said AHIA President Peter Crook. "The AHIA is pleased to have an awards program that recognises and rewards these people, on whom the future of our industry depends." Helicopter LAME/AME Of The Year: Trevor Breed, Kareela Aviation. Helicopter Pilot Of The Year: Roger De Souza, Jayrow Helicopters. Helicopter Support Person Of The Year: Maria Coutinho, CHC Helicopters. Aircrew Person Of The Year: Trent Owen, Westpac Helicopter Rescue Service. AHIA award winners at ROTORTECH 2018. From left, AHIA President Peter Crook, award winners Trevor Breed, Roger De Souza, Maria Coutinho, Trent Owen and guest and keynote speaker Chuck Aaron.